The parkway follows ancient Native American paths that connected the Mississippi River to salt licks in central Tennessee, originally worn by the Choctaw, Chickasaw and other tribes. Later white settlers used the ancient trails to extend their commerce and trade. The route is now served by a scenic road, built and maintained by the National Park Service, which has equipped the popular tourist drive with marked interpretive locations, historic sites, camping and picnicking facilities. Travellers can take time to enjoy nature trails, see portions of the original trace, relax on scenic overlooks, explore historic monuments and bridges, and find out about it all at visitor centres. The parkway is particularly popular with touring cyclists. Opening times: Visitor Center: daily 8am-5pm; closed 25 December. 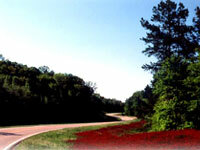 The parkway is open year-round, subject to bad weather conditions.